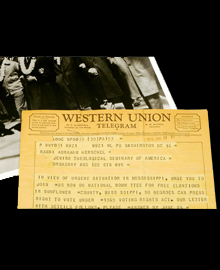 Photo and telegram, Civil Rights Movement, USA, 1965 and 1966. Abraham Joshua Heschel papers. The Human Rights Archive at the David M. Rubenstein Library partners with the human rights community to preserve the history and legacy of human rights around the world. Its archival partners include grassroots organizations and transnational NGOs, religious and political leaders, human rights advocates and artists. The Human Rights Archive’s collections document the impact that organizations and individuals have had on government policy in support of human rights, the important role that these organizations and individuals have played in the development and transformation of the international human rights movement, and the articulation of US social justice movements with the international human rights community.